In addition to earning cardholders frequent flyer miles or points, several travel credit cards offer another valuable perk: airline companion tickets and passes. To qualify for one of these tickets or passes, it’s usually a matter of meeting a certain spending threshold within a year, or just outright purchasing a pass that’s good all year long. Here are the top ten credit cards with a companion ticket benefit. 1. British Airways Visa Signature Card: One of the main benefits of the Chase British Airways Visa is the “Travel Together” companion ticket you get when you spend $30,000 within a calendar year. The Travel Together Ticket works a little differently than most other companion tickets, because rather than having to buy a full-fare ticket and get the second one for free, you use this one in combination with an award redemption, so you’re basically getting two half-price awards. The true value in this lies when you redeem for premium awards since British Airways taxes and fees are so expensive that if you were just to use this for coach tickets, you wouldn’t be saving that much money. Just to keep in mind, the travel must be solely on British Airways (no Oneworld partners), the cardholder must be on all legs of the exact same itinerary as the companion, itineraries must be roundtrip and originate and end in the US, vouchers are good for 2 years after issue, and only one Travel Together ticket can be earned per card account per year. New cardmembers get 50,000 Avios after spending $3,000 within the first 3 months. Cardholders earn 3 Avios per $1 on British Airways purchases, and 1 Avios per $1 on other purchases and there are no foreign transaction fees. The annual fee is $95. 2. Delta Reserve Card: One of the great benefits of this premium card from Delta and Amex is that in addition to the SkyClub Access it grants cardholders, each year they will also receive a free Reserve Companion Certificate that entitles them to bring along a travel companion on a roundtrip first/business or economy companion ticket with the purchase of an adult roundtrip fare on published domestic routings within the 48 contiguous United States. The primary traveler is eligible for mileage accrual so they can still earn those valuable Medallion Qualifying Miles (with class of service bonus, if they are flying in first or business class). To book, seats are only available in A and I fare codes in first class service (generally the cheapest first class fares available) and on L, U and T (discounted) fares in economy, and may not be available on all flights or markets. The other catch is, the primary ticket and companion ticket (the taxes and fees) must be purchased with the Delta Reserve card for which the companion certificate was issued. Delta also mentions that the Companion Certificate is transferable, however the primary ticket and companion ticket are not transferable once issued. Right now, the Delta Reserve card comes with 10,000 MQM’s with the first purchase, an additional 15,000 MQM’s and 15,000 SkyMiles if a member hits $30,000 in spend within the calendar year, and an additional 15,000 MQM’s and 15,000 SkyMiles if they hit $60,000 in spend during the same calendar year. The annual fee is $450. 3. Alaska Airlines Visa Signature Credit Card: The companion fare benefit that comes with this versatile card is a little different from the rest on this list. Cardholders are given a certificate code for a $99 companion fare (plus taxes, usually putting the total at around $110) within 1-2 weeks of their initial approval and then on every subsequent anniversary of cardmembership. The only restrictions for using this companion ticket are that two seats must be available, and the flights must be wholly operated by Alaska Airlines. Otherwise, the cardholder and their travel companion can use it for any fare class on any flight. Even better, both flyers still receive mileage credit and both qualify for upgrades based on the elite status of the higher flyer. One of the best uses of this companion ticket is for the cardholder to purchase a first class ticket to Hawaii and get the second one for just $99 plus taxes, essentially getting two half-price first class tickets to Hawaii. Right now, the Alaska Airlines Visa Signature card comes with a 25,000-mile sign-up bonus and you earn 3 miles per $1 spent on Alaska Airlines, 1 mile per $1 on everything else, and carries a $75 annual fee. 4. Citi Premier: Cardholders get an annual complimentary domestic companion ticket valid within the continental USA with the ThankYou Premier credit card from Citi. However, the passenger is responsible for paying all fees, taxes and charges incurred in connection with the companion ticket, and these tickets must be booked through Citi’s travel provider partner, Spirit Incentives. Though details on this companion ticket benefit are scarce, it appears you have to book a paid ticket through Spirit Incentives in order to qualify for the companion ticket – so no using it on tickets booked using points. My suggestion would be to save the companion benefit for an expensive domestic flight and ensure that there is companion ticket space available. Some further details on the card itself: New cardmembers get 30,000 bonus points after spending $2,000 in three months, and an additional 30,000 points after spending $2,000 in the first three months of their second year of cardmembership. The $125 annual fee is waived for the first year. There’s no limit to the number of companion tickets Amex Platinum members can use. 5. American Express Platinum: Among the host of perks that come with this premium card from American Express is a companion ticket benefit. Here’s how it works. There are over 20 airlines that participate in the program including Delta, Virgin Atlantic, Air France, Cathay Pacific, China Airlines, Japan Airlines, KLM Royal Dutch, Mexicana, AeroMexico, Lufthansa, South African, Etihad, Emirates, and others. There is no limit to the number of companion tickets cardholders are eligible for through the program, and there are no blackout dates—if you can buy a ticket on an eligible flight and there is space, you can get a companion ticket. However, only refundable tickets are eligible for companion tickets and international business and first class tickets are among the most expensive out there, so getting a second ticket for free isn’t necessarily the best deal out there – often two discount tickets can be cheaper than one refundable. 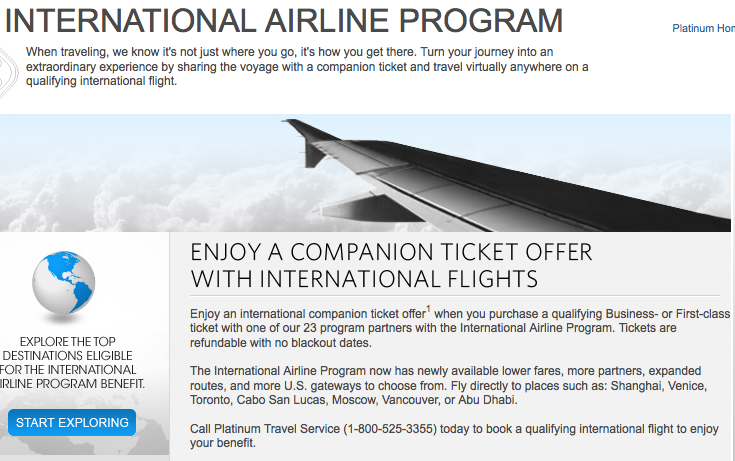 In order to book a companion ticket, you must book through Amex’s Platinum Travel Service by calling 1-800-443-7672. The Amex Platinum currently comes with a 25,000-point bonus when you spend $2,000 within the first three months, Priority Pass Select lounge access, an annual $200 airline rebate and Fine Hotels & Resorts perks among other benefits. The annual fees is $450. 6. Delta Platinum Amex: Similar to the Reserve Card companion certificate, this is good for a complimentary companion ticket, however only in economy class. Seats are only available in L, U and T fare codes and may not be available on all flights or markets. Companion certificate is valid for one round-trip economy class companion ticket with the purchase of certain adult round-trip fares on published routings within the 48 contiguous United States. Primary Ticket and Companion ticket must be purchased with your Delta SkyMiles Credit Card from American Express. While, Tickets are not eligible for mileage upgrades, Systemwide Upgrade Certificates, or Medallion Complimentary upgrades, it can’t hurt to ask at the gate especially if there are open seats in First. This card currently awards holders 20,000 Delta SkyMiles with their first purchase (5,000 of which are MQM’s), 5,000 more MQM’s when two additional cardholders are added to the account, travel perks like priority boarding and free checked bags, and carries a $150 annual fee. 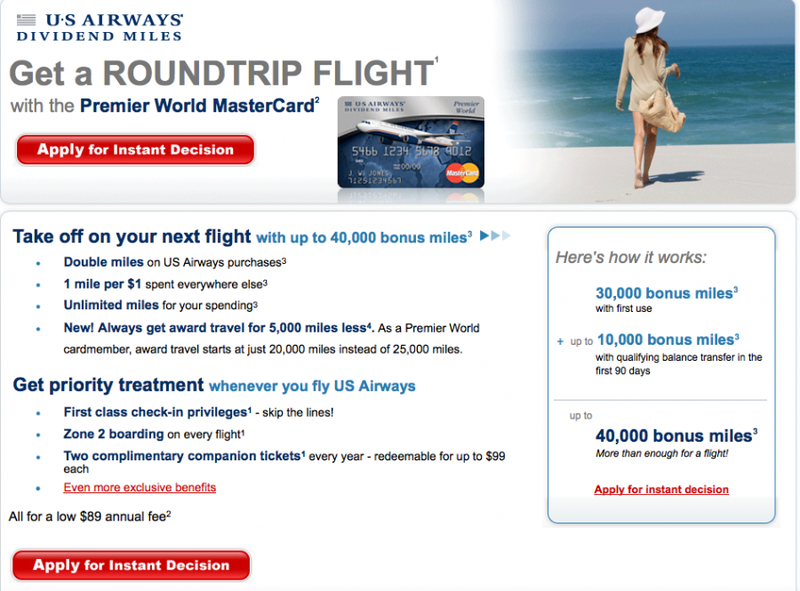 US Airways Premier World Mastercard members receive two $99 companion tickets each year. 7. US Airways Premier World MasterCard: One of the benefits of this card is that the primary cardmember is eligible to receive a companion certificate valid for two $99 companion tickets each year. The certificate is sent to new cardholders 6-8 weeks after the first purchase is made on the card and the annual fee has been paid, and then each subsequent year on the anniversary of the account opening and after the annual fee has been paid, the cardholder will receive the companion certificate (again, good for two $99 companion tickets). The companion certificate is valid for round-trip coach travel within and between the contiguous U.S. and Canada when the primary cardmember purchases a qualifying ticket with a minimum fare of $250. Blackout dates and advance-purchase requirements are detailed on the certificates themselves. This card currently comes with a potential bonus of 40,000 miles: 15,000 miles for first use, 15,000 more bonus miles with $750 spend within the first 90 days, and up to 10,000 more bonus miles with a qualifying balance transfer within 90 days of account opening. Cardholders earn double miles on US Airways purchases and 1 mile per $1 on other purchases. The annual fee is $89. This card doesn’t offer a companion pass directly, but the sign-up bonus, when 50,000, nearly qualifies for half of the companion pass (double that if you also get the business credit card bonus at 50,000). The great thing about the companion pass with Southwest is that once you hit the 110,000-point threshold are given companion pass (no need to redeem) and your pass is good not only for the rest of the calendar year, but also for the following calendar year, meaning if you scored those points in a hurry, you could have a companion pass for almost two years rather than just a one-use ticket. The other great thing about the companion pass is that it is good on either paid or award tickets, giving flyers extra flexibility. The current sign-up bonus for this card is just 25,000 Rapid Rewards points down from a high of 50,000 last fall and winter. The good news is that you if you qualify for both a business and personal card you can get both for a total of 50,000 points that do count toward the 110,000-point qualifying level for the companion pass, but that still means you’d have to spend enough on the card to get an additional 60,000 points – 2 points per $1 on Southwest purchases and 1 point per $1 on everything else. Or you could transfer points in from a partner such as Hilton, Hyatt or Marriott to score the rest – though these transfers are generally poor value propositions, so I’d only suggest it if you just need to top up your Southwest Rapid Rewards account. 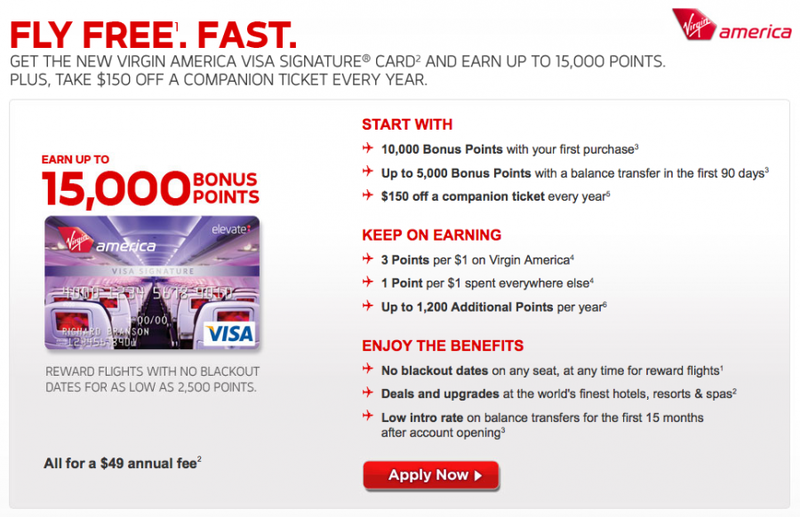 The Virgin America Visa comes with an annual $150 companion ticket discount voucher. 9. Virgin America Visa: While this card doesn’t come with an actual companion certificate, it does come with something similar. Each year, the primary cardmember is eligible to receive a $150 Virgin America Companion Ticket Discount Code. The first code will be sent after the account has been used for at least one purchase and the annual fee ($49) has been paid. The code can be redeemed for $150 off a companion ticket when traveling with another passenger on a paid published airfare on the same itinerary. 14-day advance purchase is required, and the Virgin America Visa card must be used to purchase the fare. This is great, because it can come off almost any fare, and if you find a cheap fare around $150, then it is basically like getting the 2nd ticket for free. The discount code is only valid on roundtrip ticket purchases and cannot be used on existing bookings. Minimum of 2 and a maximum of 3 passengers are required on an itinerary to use the discount and a maximum discount per booking is $150. While there are some Virgin America Visa cards with no annual fee, those are not eligible for this benefit. The Bank of America Virgin Atlantic Black Card also offers a half off economy award when you spend $25,000 in a year, however taxes and fees on Virgin Atlantic are so high that I generally don’t recommend redeeming Flying Club miles for economy awards. Be acrobatic with your points. Transfer Chase Ultimate Rewards to Southwest points then convert those into AirTran credits for the airline’s companion pass. 10. AirTran Companion Pass: This actually isn’t an Airtran credit card related companion pass, but can be achieved with the Sapphire Preferred and Ink Bold sign-up bonuses, plus $20,000 spend total. If you get the full sign-up bonus from both cards, you will end up with over 100,000 Ultimate Rewards points and then you can actually transfer those points to Southwest, and then transfer those points to the airline’s partner AirTran. Working backwards, you need 100 AirTran credits for the companion pass. Now that Southwest and AirTran are merging their mileage programs, members have been able to transfer points/miles between the two since April. 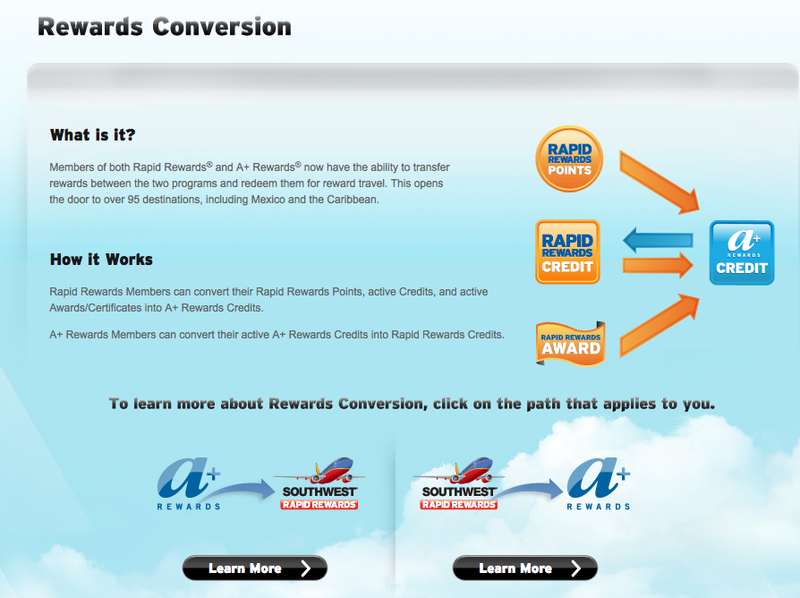 You need 120,000 Southwest Rapid Rewards points to equal 100 AirTran credits, and since Ultimate Rewards is a 1:1 transfer partner with Southwest, that means you’d just need to transfer 120,000 Ultimate Rewards points to Southwest then transfer those points to AirTran to get the companion pass. Though the companion must have an A+ Rewards account of their own and must fly with the member who gave them the companion pass on any itinerary on which it is used, travel can actually be booked separately (so you can pay for the tickets individually if you’re just traveling with a friend), and the sponsor can actually change their companion once each quarter by calling A+ Rewards at 1-888-327-5878. Though the 120,000 Southwest Rapid Rewards points you’d need to get the AirTran pass is 10,000 more than you’d need just for the Southwest Companion Pass, there are benefits to getting the AirTran one instead since AirTran has more international destinations than Southwest, especially in the Caribbean, so if you plan on taking a few tropical vacations this year, the pass could pay for itself.